Summary of the Navy’s submarine building program. We thought you might find this Power Point presentation interesting and useful. This is from Rear Admiral David Johnson ( Program Executive Officer Submarines) presentation to the Navy Submarine League on 24 October 2013. It contains a good summary of the Navy’s submarine building program. The Navy commissioned its 10th Virginia-class submarine on Saturday in a ceremony at Naval Station Norfolk. During the formal ceremony, Pre-Commissioning Unit Minnesota officially became the USS Minnesota. The Minnesota was built in Newport News, with construction beginning in February 2008 and finishing 11 months ahead of schedule in June. 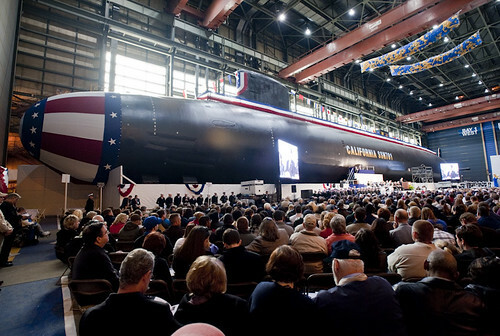 The world’s most sophisticated submarine is launched in US! USS California (SSN 781) is the most modern submarine in the world. It will help the US hold the undersea dominion. What do we know about it? Here are the facts. USS California (SSN-781), is the eighth Virginia-class submarine, and the eighth United States Navy ship named for the state of California. The contract to build her was awarded to Newport News Shipbuilding (then called Newport News Shipbuilding & Drydock Co.) in Newport News, Virginia, on 14 August 2003. Construction began in December 2006.California‘s keel was laid down on 1 May 2009. She was christened on 6 November 2010, sponsored by Donna Willard, wife of Admiral Robert F. Willard. She was launched eight days later, on 14 November 2010. California is the first Virginia-class submarine built with the advanced electromagnetic signature reduction system; although it will be retrofitted into older submarines of the class. California was delivered to the Navy on 7 August 2011, eight and a half months ahead of schedule. The $2.3 billion ship was commissioned on 29 October 2011 in Norfolk, Virginia, with Dana Nelson in command and a crew of 134. ATI Courses is scheduled to present Submarines and Anti-Submarine Warfare course on June 21-23, 2011 in Columbia, MD. We thought our blog readers will be interested in the the video below. The video aboe was shot during Australian Submarine NAVY performing torpedo practice on one of their decommissioned ships. Mark 48 torpedoes were used in this exercise. The torpedo goes off directly underneath the keel of the ship. The Stream Bubble from the explosion destroys the ship. The Mk-48 torpedo was designed in the end of the 1960s to keep up with the advances in Soviet submarine technology. Operational since 1972, it replaced the MK-37 and MK-14 torpedoes as the principal weapon of U.S. Navy submarines. With the entry into service of the new Soviet Alfa class submarine in 1979, the decision was made to accelerate the ADCAP program, which would bring significant modifications to the torpedo. Tests were run to ensure that the weapon could keep on with the developments and the weapon was modified with improved acoustics and electronics. The new version of the weapon, also known as Mk-48 Mod 4, was extensively tested and production started in 1985, with entry into service in 1988. From then on, various upgrades have been added to the torpedo, of which the current version is the Mk-48 Mod 6, a mod 7 version was test fired in 2008 in the Rim of Pacific Naval exercises. The inventory of the US NAVY is 1,046 Mk-48 torpedoes. The Mk-48 torpedo is designed to be launched from submarine torpedo tubes. The weapon is carried by all U.S. Navy submarines, including Ohio-class ballistic missile submarines, Seawolf, Los Angeles and Virginia class attack submarines. It is also used on Canadian, Australian and Dutch submarines. The Royal Navy elected not to buy the Mark 48, preferring to use the Spearfish instead. Mk-48 and Mk-48 ADCAP torpedoes can be guided from a submarine by wires attached to the torpedo. They can also use their own active or passivesensors to execute programmed target searches, acquisition and attack procedures. The torpedoes are designed to detonate under the keel of a surface ship, breaking the ship’s back and destroying its structural integrity. In the event of a miss, it can circle back for another attempt.